Those of you following this blog know I never do anything with guests and don’t ask me to because I will always say no. Always. When I am in Boise visiting friends, I tend to hang around with lawyers and judges. I am not sure why they let me tag along at times. I only have three years of law school and am not a lawyer. I think they either pity me or they envy me for not finishing that last class and becoming a lawyer. Not sure which. But his Christmastime Letters he has sent out for decades to his family and friends are well known and I have had the pleasure of reading many of them over the years. Then last fall, a number of people talked him into taking his letters and combining them into a wonderful Christmas book. I enjoyed the heck out of the book. Amazingly fun reading, laugh-out-loud funny, and a fantastic look into a down-home life of family, pets, horses, and friends. Real family, real friends, real horses and dogs. In other words, a perfect Christmas gift for anyone. So when this year’s letter came in from the judge, I loved it, as normal, and contacted Judge Bubba and asked if I could put his 2016 letter on my blog for the enjoyment of everyone here. And the fine folks who published his book did a new edition with this letter in it as well for 2016. Now understand, Judge Bubba is not in this publishing racket for the money. He has done this just because over the decades he has sent out these wonderfully funny and heartwarming letters and his friends thought the letters should all be collected. And even though I have yet to meet the judge, I completely agree. A book like this is why I feel lucky we all have indie publishing. This book is something really special. So if you enjoy this year’s Christmas essay/letter from the Judge, buy a few copies of his book for yourself and for presents for friends. It’s professionally done by the fine folks at Lucky Bat Books. And I have a hunch your friends will love it as well. 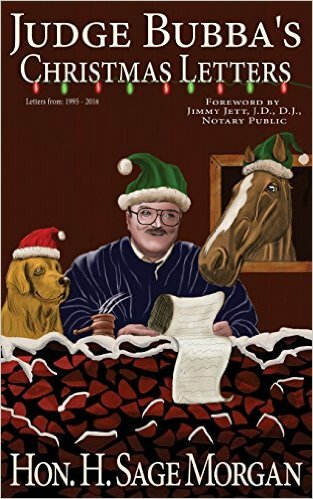 So in the spirit of the season, what follows is Judge Bubba’s annual Christmas Letter in a format that holds all the nifty pictures and Christmas stuff, just as it is in the book and in his real letter to his many friends. I don’t often recommend a book. Most of you know this. But for a wonderful treat this season, at the end of a tough year, grab this one. I am a friend of Jett s from fire fighting days and law school. Over the years, he has talked about you with unfailing respect.. I feel tha I know you a bit. Also, I know judge Bubba and His spouse . This will be a tremendous treat. Thank you for your part In Making this available. Deb, got a feeling we’ve met. I was one of those crazies in your years of law school downstairs in the law building playing Acquire with Jet and others. I was still over in architecture, but spent all my time around the law school. And my pleasure on helping get out the word on the Judge’s really fun book. Thanks for the recommendation! This will make a great gift for several people I know.